Saint Gal was born at Clermont in Auvergne, about the year 489. His father was of the first families of that province, and his mother a descendant of the celebrated Roman martyr Vettius Apagatus, who suffered at Lyons for the faith of Christ. They both took special care of the education of their son, and when he reached a suitable age proposed to have him marry the daughter of a senator. The Saint, who had taken a resolution to consecrate himself to God, left his father's house and went to the monastery of Cournon near the city of Clermont. 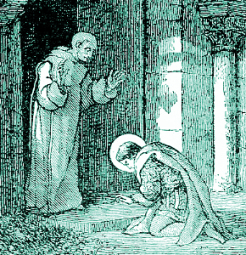 He earnestly prayed to be admitted there among the monks, and having soon afterwards obtained the consent of his parents, with joy he renounced all worldly vanities to embrace religious poverty. His virtues distinguished him and recommended him to Quintianus, bishop of Clermont, who taught him theology and was his spiritual director; he then promoted him to Holy Orders. When the bishop died in 527, Saint Gal was appointed to succeed him. In this new character his humility, charity, zeal, and above all his patience in bearing injuries, were conspicuous. Once when struck on the head by a brutal man, Saint Gal did not reveal the slightest emotion of anger or resentment, and by this meekness disarmed his attacker's rage. Saint Gal participated in the important Council of Clermont in 535; six years later he took part in the Fourth Council of Orleans. He died in the year 553 after an illness which, by the sufferings it occasioned him, manifested once more his remarkable patience. After singing the Psalm Miserere, and another in thanksgiving, he gave up his holy soul to God. Many miracles occurred at his tomb; he is invoked especially against fevers.